DNA Repair pathways in animal cells can be divided into two main categories: HR and NHEJ. HR or homologous recombination is a minor pathway but very important in protecting cells from genotoxicity. The process has two key requirements as well: a homologous sequence, usually available after DNA replication when the genome is 4N, and S-phase. A specific reporter based assay for HR can be very beneficial for anti-cancer drug discovery projects, learning more about the process of DNA HR repair and establishing intersecting pathways and druggable pathway targets. A cellular context for HR improves the physiological relevance of the results. This kit contains reagents necessary to create a complete HR reporter system in any animal cell line. It includes an HR-GFP reporter with a selectable marker and a DS DNA cleavage nuclease to initiate HR. Because GFP is a neutral gene reporter and not subject to selection, the HR process can easily be examined and assayed by assessing the %GFP or GFP intensity in a population of cells. The system is mobile in that it can be incorporated in any cell lineage or species to adapt to the investigators system of study. This cell based/cell context system has been designed to allow researchers to interrogate the HR process in live cells in vivo. This Custom HR Kit is based on a twin GFP cassette that converts from GFP negative to GFP positive cells using homologous recombination (HR). DNA repair via HR (as gene conversion) will result, since a wild type (homologous) GFP segment is present in close proximity to the DNA break. To introduce a precise DNA cleavage, a mega-endonuclease (I-Sce1) introduces a DS break in the GFP locus of Cassette 1 (Fig. 1). The human genome contains no I-Sce1 sites; therefore, an I-Sce1 site in Cassette 1 means that the DS break occurs only at this precise location and not elsewhere. The DS break initiates HR and using the WT sequence as a homology template (located in Cassette 2) the gene converts to WT and GFP positive cells appear (Fig. 2). 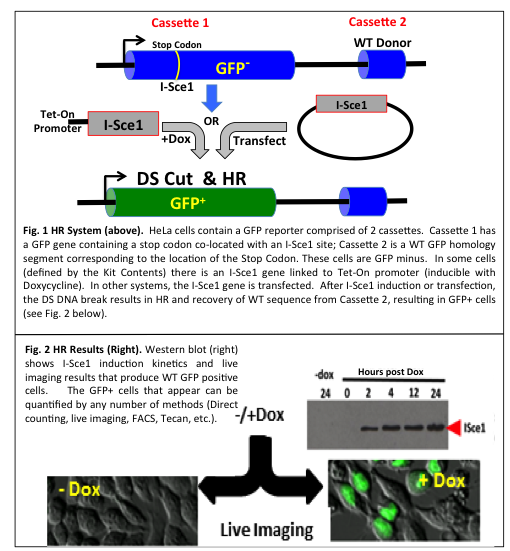 HR is triggered by a DS break which is achieved by activating an expression plasmid for I-Sce1 (Fig. 2). In summary, this kit will allow you to study and analyze HR in a specific cell lineage or cell line using a neutral GFP gene reporter. This technology lends itself to live cell imaging (by tracking single GFP+ cells). Live imaging gives essentially single cell resolution to HR analysis in these cells. In addition, the descendants of DNA repair can be tracked, since these cells are also GFP positive. HR-HeLa cells included in the DR3000-Custom-Sce Kits only: These are a reference cell line included in the kit. The HR-HeLa cells undergo HR after transfection with an I-Sce1 expressing plasmid (can be easily introduced by transfection). DR3000A-Custom-Sce Kits do not include this cell line. Plasmid DNA: pSCE1 expresses the mega-endonuclease I-Sce1 at high levels (required to incite a DS DNA break in Cassette 1). Plasmid DNA: DR-HRGFP. This is the HR reporter plasmid shown in Fig. 1. Puromycin Stock: Used to counter-select cells that have taken up and are expressing DR-HRGFP plasmid (in your specific cell line). This kit may include a reporter cell line ready for culture shipped at ambient temperature. The cells can be stored at 4° C for no more than one week before plating. Other reagents should be stored at 4° C (short term) or -20° C (long term) upon receipt.